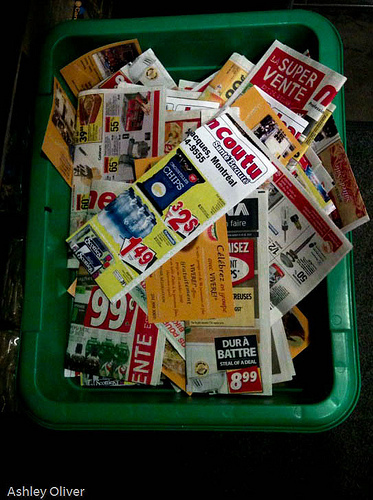 In my November 9, 2009 post I wrote about the glut of mail we all receive and ways to cut down. The US Postal Service had delivered some damaged mail in a special envelope. How nice, except the damaged mail was junk mail. At the time I only knew of a few sources for eliminating the wasteful catalogs and unsolicited advert mail I was receiving. My way of dealing was to phone each company and nicely request to be removed from the mailing list. Ehow had and still has a list of options. Then my brother introduced me to CatalogChoice.org which at the time only dealt with, you guessed it, catalogs. Catalogs account for only 15% of unsolicited mail. Now CatalogChoice.org has expanded their services to include phonebooks, credit card offers, coupons and other letter-sized direct mailings. I say, thank you, thank you, CatalogChoice.com. It is easy to sign up and create your opt-out requests on the site. Taking the time to do this now can save time, energy, trees and recycling hassles in the future. I think it’s a good idea to ACT NOW before those annoying holiday catalogs are addressed, stamped and on their way to your mailbox. I am the wife of a Feng Shui teacher. No one is perfect. We have clutter that builds up and is regularly cleared . I do not live in a museum and although my house is clean, I am not a crazed tidy-up queen. I have a life. So, okay, it was acceptable when my kids were little – roller skates, skate boards, baseball mitts, shoes, boots cluttering up the mudroom. At that time it seemed that no amount of shelving, hooks, labels and pick-ups would ever keep up with the mess. Now the boys are out of the house and I still find it challenging to make order in the mud room. Is it me? Or is human nature? Is it because there is too much stuff in there to begin with? Do I just delegate recycling, step stools, boxes, re-gifts, books and things to give away, shoes belonging to kids who don’t even live here, etc to the mud room because I don’t know where else these things could go? Most definitely. What really belongs in there? I have some favorite organizing support teams. Sadly Organizing Magazine , just awarded “Best Organizing Magazine 2008” at the Organizing Awards in LA has just gone out of business? Can you imagine? I mean how many organizing magazines can there be? A fun site is Clutter Control Freak, thanks to them for our cartoon and concise article about how much extra stress we create by having something hanging over ones head and putting off doing it….like cleaning the mud room. You know I can really relate to that- it only take a few minutes to unload the dishwasher, and just a few to load it up, but you’d think it was the longest job in the world when I ask Micah to take the time to do that while his toast is toasting. I’d like to add that there are probably lots of things I might not need in my mudroom that someone would really like and it behooves me to uncover those things and take them to the thrift shop asap. Okay, so, hm, yeh, I’m going to wait for my husband to come home to do the mudroom (procrastination) and I’ll deal with under the sink today. It was a landfill- the recipient of refuse from Barcelona and the surrounding area for over 30 years, piled over 100 meters deep in some places. 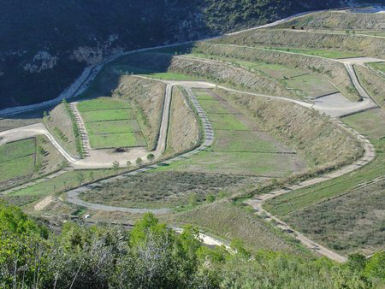 According to WorldArchitectureNews.com the goal is that the adjacent Parc del Garraf absorb the dump by using the local forest tissue and supporting the establishment of primary ecosystems. They have engineered terraces, drainage systems, tapping bio gas for electricity and an underground filtration system for the contaminated water that drains through creating water for the irrigation system of the park. 20(49.42 acres) of the 60 hectares have been completed at this time. This idea has just won the Energy, Waste and Recycling category at the 2008 World Architecture Festival held last week in Barcelona, Spain. The project has been underway since 2000 and is not yet complete. The judges of the competition have described the reclamation project, “a perfect example of bringing dead nature back to life by converting rubbish into a beautiful piece of landscape architecture…using few and humble means”. The great news is that this system and others presented at the festival offer some simple and low cost solutions for waste. For example, the Community Cooker, a Kenyan group, has a UN- sponsored project in Kibera — a sprawling shantytown in Nairobi. There are millions of people there and no waste collection. People literally walk through garbage all day. Now they can recycle waste to fuel a giant cooker in this poor neighborhood where many never have a hot meal or warm water to bathe in. Youth are being paid to gather the garbage and residents can use the heat to boil water and cook hot meals. These kinds of creative solutions can have a powerful social impact. I look forward to sharing more ideas like these. I have found the gadget I’ve been dreaming of- better than worm composting, better than a trash compactor, better than shlepping out in the middle of winter to the compost pile with organic scraps, it’s an indoor composter. How’s this: – automatically mixes, heats and aerates, separates fresh materials from finished compost, allowing you to access finished compost continuously throughout the year, uses an internal air filtration system to eliminate unpleasant odors and makes compost in as little as two weeks! It is made from stainless steel and recycled food-grade polyethylene, uses only 10 watts of power, EnergyStar compliant. This composter recycles its weight in waste every 10 days, diverting over two tons of waste from landfills over its life. Every kitchen needs one.